* ACCOMPANIED LOCAL BOAT VIEWINGS - You can be doing other things with your spare time and don't have to spend money on fuel for your car to travel to meet customers. * UNLIMITED PICTURES OF YOUR BOAT IN ADVERTISING - We invest in internet advertising trade accounts allowing full photo packages not generally available to private sellers. * SPECIALISTS IN THE SALE OF MOST BOAT MANUFACTURERS - Having sold over 600 boats Doug has excellent working knowledge to advise potential buyers on your behalf. * ABYA QUALIFIED BROKERS - We are ABYA trained for good practice and operate professionally with a secure bank client account for brokerage transactions. We handle all the conveyancing for you ('Sale and Purchase' agreements, 'Bill of Sale', Boat registration, Finance settlement, Insurance assistance). * OVER 16YRS EXPERIENCE OF SELLING BROKERAGE BOATS - We have rounded experience of most boat sales situations and can offer excellent advice to buyers to help achieve the end goal of selling your boat. * COMPETITIVE COMMISSION RATES - We don't charge VAT on our commissions and are always happy to 'talk a deal' to win your business. * 'NO SALE/ NO FEE' - It costs you nothing to advertise with us and our competitive rate commission is only payable when we've negotiated a sale price that you're happy with. You have nothing to lose and are not tied into a contract. * NO 'SOLE AGENCY' REQUIREMENTS - You can explore other avenues to sell you boat if you feel the need, we just ask you to advertise at the same price. * PRIME OFFICE LOCATION - Our office is based at a large and long established boatyard at Gallows Point, Beaumaris. We are just across the Menai Straits from Bangor in North Wales and are always busy with considerable passing trade from the Petrol Station and Chandlery next door. Your boat will be seen by many buyers browsing our shop window. * EXTENSIVE INTERNET ADVERTISING - In addition to our shop and website we also pay to advertise your boat with The Yachtmarket (.com) and Apolloduck (.co.uk). These are large 'search engine' style websites that give exposure to hundreds of thousands of boat buyers all over the UK and continental Europe. * MOBILE BROKERAGE SERVICE FOR NORTH WALES - From our office in Beaumaris we can travel to your boat to take a portfolio of professional images for the internet and for our shop window displays. A large number of quality photographs are essential to encourage buyers who don't live nearby to travel to view your boat. 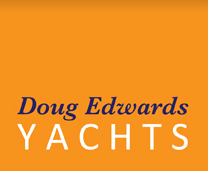 We hope you can see the advantages of listing your boat for sale with Doug Edwards Yachts. Please do call us on 07747 034 300. If you prefer you can also e-mail us at info@dougedwardsyachts.com for more information of our services.